When I was a kid, I always looked forward to the new school year. Granted, it would fizzle out after a few days back at school, but I’d get really excited about seeing all my friends again and of course, having shiny new stationary and crisp, clean notebooks to get the year started. Fast forward to adult life and I still get excited about starting the year with fresh new stationary. I guess you could stay, I’m a stationary hoarder. 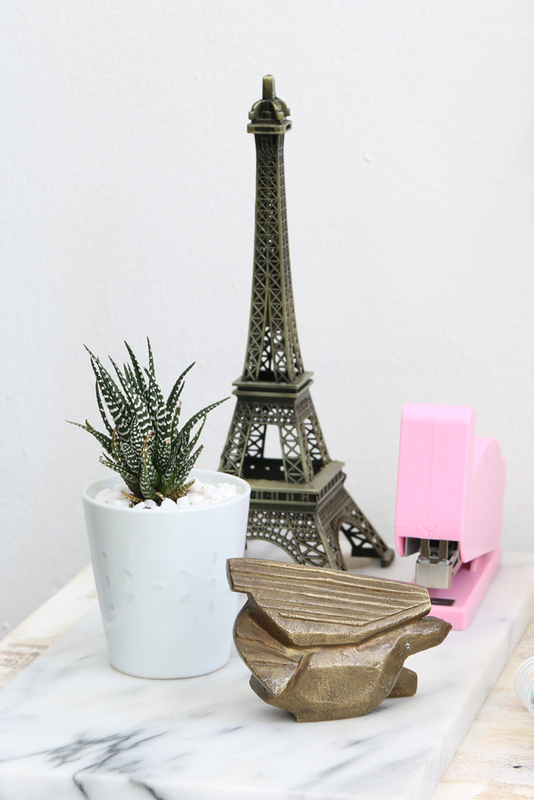 I love pretty things that make my desk space more exciting. My fave local stores to shop for cool new office shizz are Typo, Superbalist and MRP Home, but there are so many great places. Sometimes, you find the coolest stuff in the most random places. Take my wooden stag heads (which I DIY-ed with gold, spray painted tips). I found these gems, randomly one day on the way to gym. A street vendor was selling them and they are not only beautiful, but so unique too! My Anthropologie Monogram mug always makes my desk a happier place. 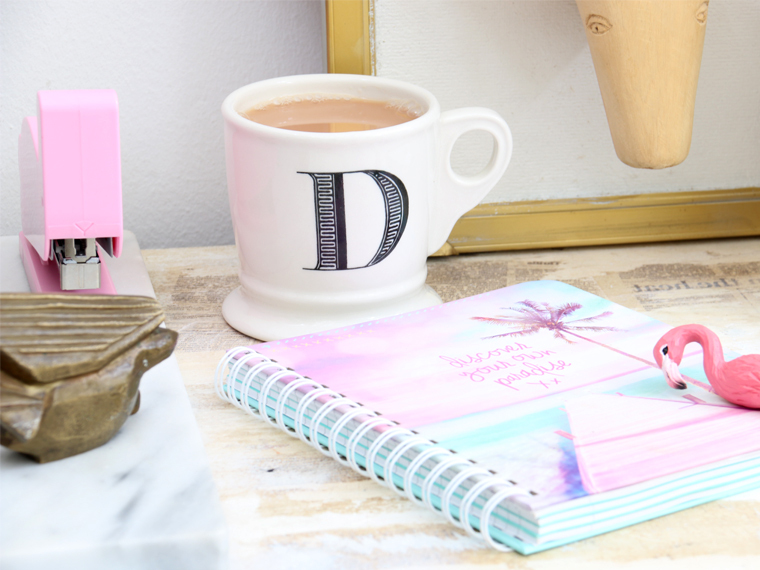 A big ‘ol cup of tea in the morning as I start my day in such a cute mug… Nothing quite like it. And don’t even get me started on notebooks and cute stationary. 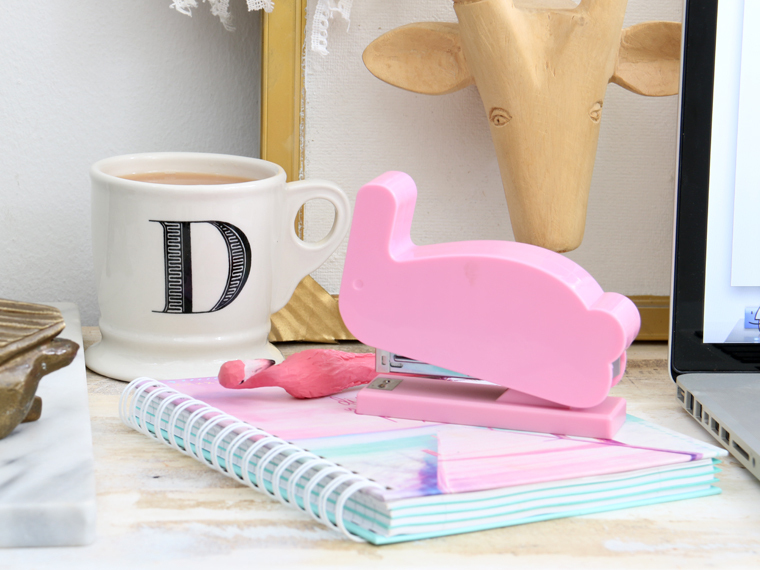 How amazing is my wittle bunny stapler that I bought from Superbalist? And my pretty pink notebook and flamingo pen – both from at Typo! Man, I love that place! Sometimes, making your own cool shizz is even more rewarding and makes your space unique. I made my gold ‘wall feature’ last year when I updated my desk to a glam gold workspace and I still love it just the way it was, with only the addition of my crochet dream catcher from Typo). If you head on over to last years post, you’ll find the links for you to download the gold pineapple printable, as well as my free ‘Live By The Sun, Love By The Moon’ print and I’ve shared my favourite gold spray paint over on that page. Seriously, if you want to make anything gold. This stuff is the bees-knees and then some. I think I’ve gone through three cans already, and I’ve got some stashed in the garage for the next time the gold spark strikes. Now, if you’ll excuse me, I’m off to get more awesome content prepped with the help of my awesome desk-accessories. Next Post Get Rid of Pigmentation?